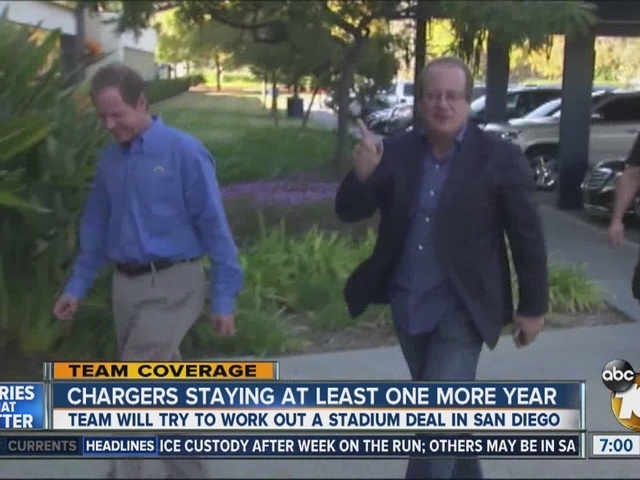 SAN DIEGO - Chargers owner Dean Spanos announced Friday that the team will play the 2016 season in San Diego, and he hopes to work out a long-term deal with the franchise's home of 55 years. Spanos also said he reached an agreement with Rams owner Stan Kroenke to share a future stadium in Inglewood, in Los Angeles County, but that his focus is on San Diego. 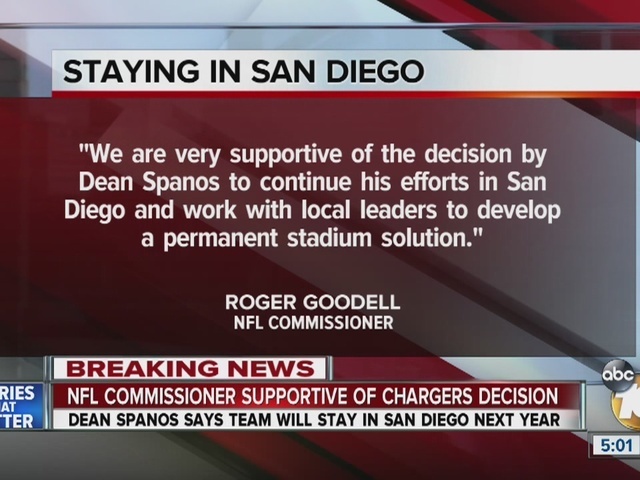 We are very supportive of the decision by Dean Spanos to continue his efforts in San Diego and work with local leaders to develop a permanent stadium solution. NFL ownership has committed $300 million to assist in the cost of building a new stadium in San Diego. I have pledged the league's full support in helping Dean to fulfill his goal. "We appreciate Mr. Spanos' commitment to staying in San Diego for the 2016 season to work with the region on a stadium solution. We look forward to discussing his vision for a new San Diego home for the Chargers, and will be working with him and our negotiating team on a fair and viable plan to put before voters. We have agreed to meet again in the near future." Spanos has been demanding a new stadium for around 15 years, but has been stymied by the city's former financial problems, the recession and limited options for sites. The city and county of San Diego have offered to share in the cost of a new facility in Mission Valley, adjacent to aging Qualcomm Stadium. The Chargers, however, ended negotiations on the project last June. Hint: The QB is Fired Up. Earlier this month, NFL owners voted overwhelmingly to allow the Rams to return to Los Angeles, where Kroenke plans to build a stadium on land he owns at the former Hollywood Park. The owners also gave the Chargers a one-year option the join the Rams. After the decision, several owners indicated they were reluctant to have the league depart San Diego. The Chargers owner and elected officials will have to put aside an acrimonious 2015 in order to forge a deal that would go before voters. They would also have to work quickly if they want a measure on the June ballot, since deadlines are looming. Because the city/county financing proposal doesn't include new taxes, a ballot measure would require only a simple majority to pass. At a news conference after the owners' decision on moving the Rams, Faulconer and Roberts extended an olive branch of sorts and said they had an opportunity for a fresh start. They said the Mission Valley site offered the best chance to start construction quickly, but they were open to a possible downtown location if that's what Spanos prefers -- though that option presents obstacles that could delay construction for several more years. If Spanos can't reach a stadium deal in San Diego, or the ballot measure fails, he'd still have the agreement with Kroenke to fall back on. Chargers players reacted positively to the news that they would remain in San Diego for at least one more season. "Can't wait for this season and knowing we will be playing at HOME! Let's go San Diego!," running back Danny Woodhead tweeted. Receiver Keenan Allen tweeted, "Now let's see sell outs every home game! And not the other teams colors!" Spanos did not refer to Thursday's report that the Chargers applied for permits with the city of Santa Ana, in Orange County, to use five acres as a temporary headquarters and practice field while the Inglewood stadium is built. Special counsel Mark Fabiani said the submission had to happen now because of the long time it takes to get approvals, and install turf to be ready for preseason training camp.